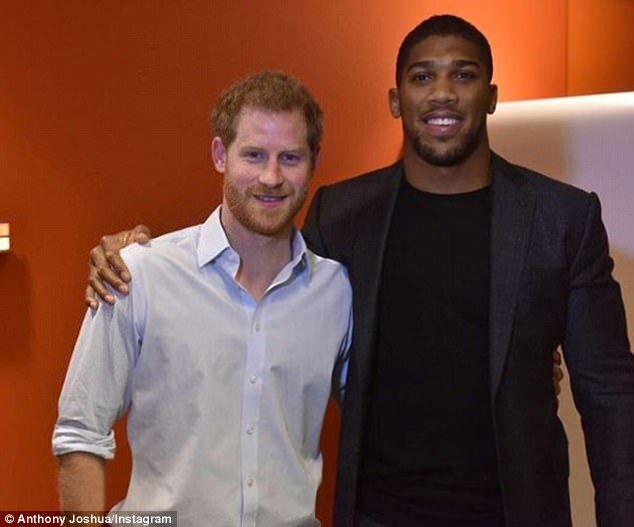 Anthony Joshua dropped in on Prince Harry as the royal guest edited the Radio 4 Today programme. The heavyweight champion wished him the best of luck with his temporary role and also congratulated him on everything this year, including his engagement to Meghan Markle. Joshua and Prince Harry were pictured chatting alongside presenter Gary Richardson. They also performed the trademark ‘clenched fist’ pose at the BBC offices. The 33-year-old prince has taken the helm of the popular radio show temorarily and is guest editing from 6am to 9am. During his interview on the show, Joshua spoke about the challenge of aligning his responsibility of being a role model with performing in the ring. He said: ‘Winning is the easy part. Taking on the responsibility of being a champion is the hard part. ‘It’s important to be real – we do make mistakes, we aren’t perfect but we are trying,’ he added. Joshua is preparing for what he hopes with be another stellar year in the ring after reaching new levels of stardom in 2017. He stopped Wladimir Klitschko back in April in front of a packed out Wembley Stadium and speculation abounds the identity of his next opponent. A fight with Tyson Fury would no doubt capture the public’s attention but AJ’s promoter Eddie Hearn has said the ‘Gypsy King’s’ demands render the all-British clash ‘unmakeable’. WBO champion Joseph Parker is a more likely opponent and Hearn is looking to finalise terms with the New Zealander over the festive period. Another unbeaten year could see the 2012 Olympic Champion solidify his boxing royalty to mirror Prince Harry’s elevated status. This entry was posted on Wednesday, December 27th, 2017 at 5:18 pm	and is filed under General. You can follow any responses to this entry through the RSS 2.0 feed. You can leave a response, or trackback from your own site.